Yofix Probiotics Ltd, the winner of PepsiCo’s European Nutrition Greenhouse Programme 2018, has launched its first dairy-free, soy-free yoghurt alternative line with three fruit flavours. The products are based on a unique, clean-label formula made from just a few natural ingredients. It is traditionally fermented and contains live probiotic cultures plus the prebiotic fibres that feed them. The new product line is environmentally-friendly and vegan, and leaves a low carbon footprint, since there is no use of cow milk and, unlike almond or cashew, does not require a great amount of water. Most importantly, the production process is carefully designed to ensure zero waste. All raw materials utilised in production remain in the final product. Increasingly important to health-minded consumers is the health of the environment, driving them toward sustainable products that leave a minimum footprint. Unfortunately, most of the yoghurt alternatives on the market can’t meet dairy yoghurt when it comes to taste, texture, and nutrition. Or, to be a good source of protein, calcium and fibre, they compromise organoleptic characteristics. Yofix offers a new-generation yoghurt alternative that hits all the marks for flavour, texture, nutrition and eco-friendliness. It has no added sugars, flavours, colours or preservatives. Behind Yofix is Ronen Lavee, an agricultural mechanical engineer with lactose intolerance. 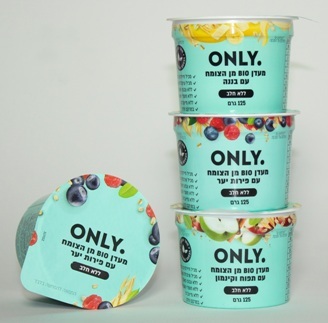 Lavee, who serves as the company’s founder and chief executive officer, returned to Israel after eight years in Asia, and could not find a dairy-free yoghurt alternative with good flavour and texture. He experimented with over 100 fermented formulae based on natural ingredients until he found the Bio 5 formula. It uses no added sugars, preservatives or colours. Yet it has the texture and great flavour of yoghurt. Typically, gums and thickeners are added to dairy-free yoghurts to stabilise them, but the Bio 5 formula, together with Yofix’s advanced technology, created the similar texture and stability of yoghurt, without additives. Moreover, since dairy-free yogurts often lack key vitamins and minerals, fortification is required to match dairy yoghurt’s nutritional value. Most dairy alternative yoghurts available are high in fat, and use a single base ingredient, such as soy, almond, or coconut. They have low amounts of calcium, iron, and fibre. Also, almond and coconut milk are not high in protein, a nutrient in high demand by yoghurt consumers. But Yofix’s Bio 5 formula contains all these nutrients naturally, without need for fortification. The company launched the plant-based yoghurt line with Strauss Dairies in Israel last month under the Only brand in three flavours to target the rapidly-expanding demand for vegan, flexitarian and lactose-intolerant populations. The start-up was the first company to join The Kitchen, the leading food-tech incubator and seed investor in Israel, and part of the Strauss Group Ltd, the main investor in Yofix.